KYOTO (Kyodo) A burial mound that may be one of the largest from the mid-to-late Yayoi Period ever unearthed in Japan has been found at the Hiyoshigaoka Ruins in the town of Kaya, Kyoto Prefecture, officials of the local board of education said Thursday. The Yayoi Period covers the era equivalent to around 200 to 100 B.C. According to the officials, the size of the rectangular mound is second only to those at the Yoshinogari Ruins in Saga Prefecture. 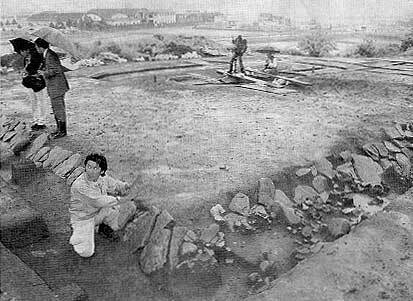 The burial mound stands 2.5 meters high, 33 meters long and around 20 meters wide. It features stones stuck into its sloping sides, a style unique to ancient ruins found along the Sea of Japan, according to archaeological experts. A great many beads and other artifacts have been unearthed from the mound, which is thought to have contained one body, the experts said. This has led them to believe that a powerful king ruled the area of the Tango Peninsula at a very early period in Japan's history, they added. Other artifacts dug up from the site lead experts to believe that the mound dates back to the first century B.C. According to the town's board of education, the four sides of the burial mound are covered with flat stones that measure at least 40 cm. Mounds of this kind are scattered along the Sea of Japan coast from Shimane Prefecture to Kyoto Prefecture. The person laid to rest in the mound appears to have been placed in a wooden coffin, although both the wood and the skeleton have since disintegrated. But a considerable amount of mercury-based red pigment was discovered around the area where the head would have rested. Around 430 beads made of tuff were also found at the site, the experts said. The latter constitutes the third-largest haul of tuff beads to be uncovered at one site, they said. The archaeological experts said they also found around 40 carbonated grains of short-grain rice that they believe were sprinkled over the body at the time of burial. It is very rare for rice of this kind to be unearthed in such quantity from a burial site, they added. The site will be opened to the public on Sunday.